Minus a couple of hiccups, Samsung is reliably updating its later models to the last version of Jelly Bean. 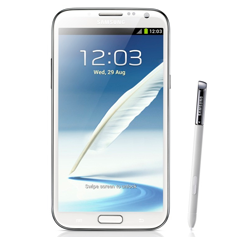 Sprint's branded version of the Galaxy Note II is the latest phone to get the Android 4.3 magic, complete with updated compatibility with Samsung's Galaxy Gear smartwatch. Gotta sell those $300 add-ons, eh Sprint? Samsung is following its release schedule almost to the letter. In addition to Android 4.3 goodies and Gear compatibility, this particular update (L900VPAMK4) adds HD Voice enhancements, Samsung KNOW compatibility, and a few visual touches to bring the Note II more in line with UI elements found on the Galaxy S4 and Note 3. As usual, the rollout will be coming in stages, so some of you may already have an alert while others may not get it for a day or two. Root users, it's always safest to assume that any new over-the-air update will break your root functionality and make it difficult or impossible to get back. If root is important to you, wait for the industrious fellows at XDA, RootzWiki, or your Android forum of choice to find a solution. 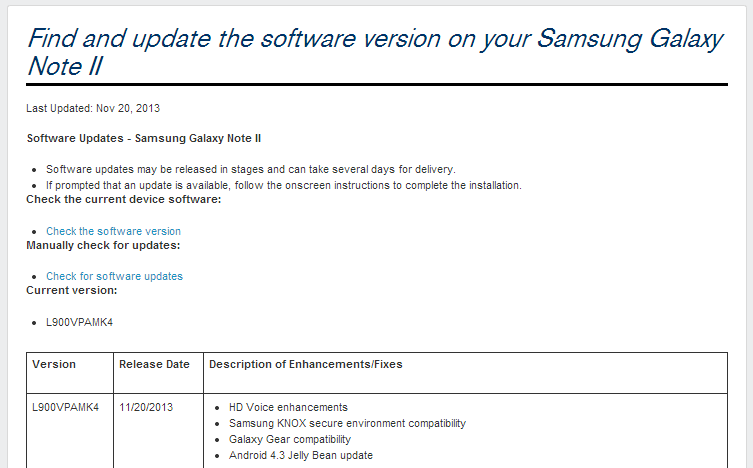 Everyone else, you know the drill: Settings, System Update, Update Samsung Software. Source: Sprint Support - Thanks, Jeff!